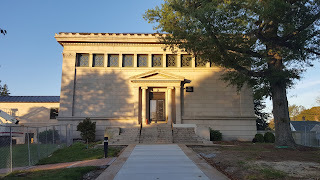 "For the first time in a decade, staff members at the Franklin Public Library won’t have to seek a waiver from the state Library Board of Commissioners to operate under the minimum budget while maintaining certification. That’s because the Town Council this week gave the library budget a significant boost, voting to increase the appropriation from $900,301 to $999,000 - bringing it to a level that meets state certification standards, and ensuring the library does not have to apply for the waiver of the Minimum Appropriation Requirement (MAP) with the state. “It’s long overdue,” Town Administrator Jeffrey Nutting said of the action, noting that it “kind of goes hand in hand” with the recently completed renovation and expansion work. Library Director Felicia Oti said the extra money comes as good news to the library’s staff, and will mean good things for patrons as well."